This is a picture of not one, but two registration forms for next year’s preschool enrollment. Our forms are due in February for the following school year and I am staring down the paperwork for BOTH of my children. EEK! Calvin turns two this summer and while that seems impossibly young to me, I realize that many children start daycare as tiny babies and I have been so fortunate to be home with him all this time. Oscar started at the age of 3 and at the time, I remember wishing I had started him sooner. He simply loved it! There are a few reasons I wanted to go ahead and take the plunge this year with Calvin. I’ll share them here in case you are in a similar situation and trying to decide for yourself. Also, because I love using bulleted lists. We love the teachers – Oscar started mid year in the 2s-turning-3 class and we loved the teachers! I want Calvin to have the benefit of these two sweet ladies on his first year of school also. This will be Oscar’s last year – Oscar will be entering the 4 year old (pre-K) class which means it will be his last year of preschool!! Even though they won’t see each other much, I would love to have Calvin and Oscar there at the same time. Calvin loves being there – Whenever we pick up Oscar from school, Calvin loves wandering the halls and trying to sneak into the rooms and play with the toys! He is very social and wants to interact with everyone. I am ready – I don’t think I could send Cal to school tomorrow, but knowing he will be 8 months older when he actually starts class, I am really looking forward to the growth it will bring for all of us. I’d be lying if I said the idea of 3 hours to myself 3 days a week wasn’t completely thrilling. Jerry and I have discussed it and we think it’s time! Still, any time there is transition (even the good kind) I get a little weepy and sad at the passing of an era. Thankfully, having gone through this with Oscar already, I know this will be good for us. I am holding on to the positive. Upward and onward folks! 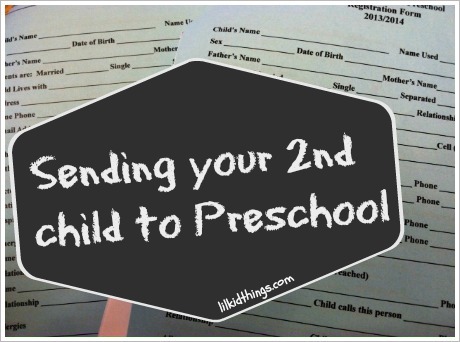 Did you send your 2nd child to preschool? How did you make your decision? You know my feelings. I cried when I dropped E off but she loves it. I just wish our school had a three day options. Thanks friend! I know it will be hard on that first day, but I hope he loves it too!